I am not the creator of this image. No copyright infringement intended. Wow, rereading a book with the knowledge of what's going to happen is really awesome! I got to catch on things in the beginning that I never did before. I am not sure if this is my first or second reread, but when I first read this, I was still in grade school and I didn't think the same way that I do now. But I must say, Harry Potter is definitely amazing no matter how many times I read it. Yes, it's a bit juvenile, but it's written for kids anyway. And even now that I am reading this one as a teen, I cannot disregard that this book is a work of art. Yes, art - bringing readers into a vivid, magical mystery that is filled with colors and easy to imagine. I definitely loved J.K. Rowling's writing style with this one! I must say, J.K. Rowling is good at throwing people off haha! Of course I knew how things were going to work out in the end, but I can imagine how those who haven't read the book yet can be misguided. 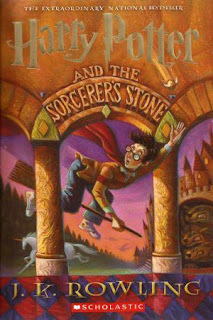 My favorite scene from this book is when Nevile finally stood up to someone, which just happened to be Harry, Ron and Hermione. 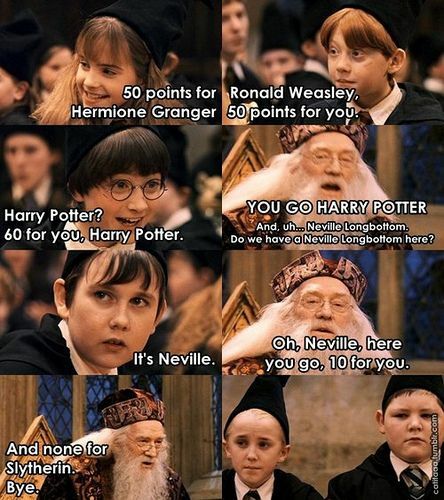 It cracked me up when Ron told Neville, "Yeah, but not to us." My second favorite is when the trio each had a certain "job" to complete in the end, so that each of them was useful, and it wasn't just centered on Harry. Harry Potter is definitely a must-read for kids and adults alike. On a side note, imagine the whole book in Hermione's perspectives. I bet there would be no chapter without mention of how stupid the boys are. Haha! Ahh, that's so awesome that you've reread this book! I think I must've read it like 3 times, and now I am planning on renewing my whole Harry Potter collection (since they have some beautiful new covers at my book store) and reread the entire series! Can't wait! I mean, as a book reviewer, you've got to have all the Harry Potter books in your review archives, right? ?